The origins of such beliefs make for an interesting study of how worries about modern foods combine with a fear of environmental toxins to create anxiety that requires a convenient place to be attached – in this case, MSG acts as the “hook”. From a scientific point of view, the question of MSG toxicity/allergy is largely settled in the negative. However, considerable interest remains in the question of why glutamate acts so reliably as a flavor enhancer. It is straightforward to demonstrate, for example, that savoury foods containing added MSG are evaluated as having greater flavor intensity as well as being more liked . In this regard, MSG acts much like fat and sugar and this analogy has been used to in studies in which MSG has been used to promote liking for novel flavours. Repeatedly pairing MSG with a novel flavor in solution results in that flavor becoming more liked , which is the same effect produced by either fat or sugar. The proposed mechanism for these latter preference boosters is based on the use of the energy provided by fats and sugars by the body, converting the otherwise ‘meaningless’ flavor into a (liked) signal that energy is being delivered. This is variously referred to as ‘post-ingestive’ or ‘flavour-nutrient’ conditioning. Either way, the idea is that a link is learned between the flavor and a positive consequence of ingesting something that is valued by the body. This argument is well supported by demonstrations that these conditioned learning effects only occur when the energy/flavor pairings happen in a state of relative hunger – that is, when the energy is most valued. So, is glutamate an energy source, like sugar and fat? Possibly, although there is also evidence that the glutamate that we take in our diet is used for a variety of important metabolic processes  that could underlie the conditioned liking. Another persistent hypothesis is that the presence of glutamate is a signal to our bodies for the presence of protein. This makes intuitive sense, since glutamic acid is a key amino acid present in proteins. But while there has yet to be convincing evidence for one hypothesis over another, any or all of these effects could support flavor preferences. Regular readers will recall the distinction made between liking and wanting (October, 2012: Learning to want). More recent research has shown that not only does the presence of MSG promote novel flavours into preferred ones, it acts also on motivation to eat, that is, wanting. Flavours conditioned with MSG increase appetite and promote increased consumption of the flavoured foods, at least in the short term . A recent publication by Una Masic and Martin Yeomans from the University of Sussex has explored further the effects that added glutamate may have on how we eat . They first raise the possibility that since glutamate makes food more palatable, we might expect increased intake of glutamate enhanced foods over the longer term. “MSG may lead to reduced satiation (as a consequence of its effects on palatability) but enhanced satiety, by acting as a cue for protein ingestion”. In investigating this question, the researchers prepared three soups: a control that was low in energy, a more energy dense version and another that was higher in protein, each with or without added MSG. Initially, hunger decreased but only when there was no added MSG, and only in the context of added protein. To put this another way, adding MSG to a protein enhanced soup maintained hunger. Assessing hunger ratings for a longer period of two hours after the soup was consumed showed, as predicted, a significant suppression of hunger at least for the first hour after consumption. This time it was when MSG had been added, but again this was only evident in the protein enhanced version. These data suggest a very important role for glutamate in regulating food intake, at least for protein-based foods. In doing this, the data also enhance the link to protein signaling, proposed as an explanation for glutamate palatability. Satiety and satiation are known to be influenced both by the nutrients present in foods and by a food’s palatability. This study steps up the complexity a notch by showing how an ingredient that affects palatability can modulate both processes when it interacts with the nutrients in the food. We know already that taste (in the broad sense of the term) is the best predictor of what we eat. This study suggests too that a taste (in the narrow, more technical sense) can also be a strong influence of how much we eat and when we are likely to feel hunger again. As a final thought, it is worth considering how those who brand MSG a toxin could possibly account for glutamate’s complex influence on appetite, hunger and palatability. Increasing food preferences and intake is usually considered incompatible with neuro-(or any other kind of)toxicity. 1. Fuke, S. and T. Shimizu, Sensory and preference aspects of umami. Trends Food Sci. Technol., 1993. 4: p. 246-251. 2. Prescott, J., Effects of added glutamate on liking for novel food flavors. Appetite, 2004. 42(2): p. 143-150. 3. Yeomans, M.R., et al., Acquired flavor acceptance and intake facilitated by monosodium glutamate in humans. Physiol. Behav., 2008. 93: p. 958-966. 4. Reeds, P.J., et al., Intestinal glutamate metabolism. J. Nutrit., 2000. 130: p. 978S-982S. 5. Masic, U. and M. Yeomans, Does monosodium glutamate interact with macronutrient composition to influence subsequent appetite? Physiol Behav, 2013. 116-117: p. 23-29. I am director of TasteMatters Research & Consulting, and author of the recently published Taste Matters. Why We Like The Foods We Do. (Reaktion Books, London). I was trained in experimental psychology and have worked in food perceptions and preferences for 25 years at universities and research centres in Australia and New Zealand. Since 2005, I have been Editor, Food Quality and Preference, the leading journal for sensory/consumer science, and am also a member of the executive editorial board of Chemosensory Perception. 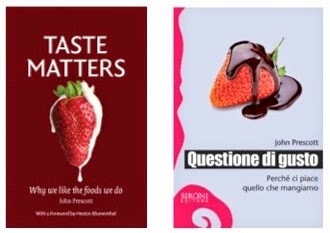 I have authored 80+ journal articles and 20 book chapters on topics including cross-cultural taste preferences, perception of pungency, the genetics of taste perception, and flavour perception and preference. · Masi, C., Dinnella, C., Monteleone, E. & Prescott, J. (2015) The impact of individual variations in taste sensitivity on coffee perceptions and preferences. Physiology & Behavior, 138, 219-226. · Spinelli, S., Masi, C., Zoboli, G.P, Prescott, J. & Monteleone, E. (2015) Emotional responses to branded and unbranded foods. Food Quality and Preference, 42, 1-11. · Prescott, J. and Stevenson, R.J. (2015) Chemosensory Integration and the Perception of Flavor. In: R. L. Doty (Ed. ), Handbook of Olfaction & Gustation (3rd Ed): Modern Perspectives John Wiley & Sons, pp. 1008-1028. · Prescott, J., Hayes, J. & Byrnes, N. (2015) Sensory Science. In: N.K. Van Alfen (ed.) The Encyclopedia of Agriculture and Food Systems. Elsevier, pp. 80-101. December 17th, 2013: Who doesn't enjoy a nice satiety story at Christmas!